These Candy Crush Jelly Level 12 cheats and tips will help you beat Jelly Level 12 of Candy Crush. 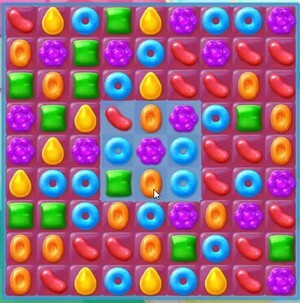 The objective of Candy Crush Jelly Level 12 is to spread the jelly across the 3 playing fields in 30 or fewer moves. Candy Crush Jelly Level 12 is one of the levels that you will enjoy playing. Although it is designed in 3 playing fields, it is very easy to beat. There are no obstacles at all in this level and all that you need to do is spread the jelly across the 3 playing fields in 30 or fewer moves. To reach this target, you must maximize on the moves by ensuring that you have spread the jelly to a large part possible. The first board has an area of 3×3 squares at the center that must be spread with jelly so as to proceed to the next stage. You can achieve this by matching candies adjacent to it, but the use of special candies will consume just a few moves to finish this part. A striped candy combined with a wrapped candy spread the jelly in this part of Candy Crush Jelly Level 12 easily. These Candy Crush Soda cheats and tips will help you beat Candy Crush Soda level 409. The objective of level 409 is to Bring down 1 Hazelnut and 1 Cherry and reach 20,000 points in 50 moves. With as up to five candies of the same color on the playing field, you should have an easy time creating special candies. Make an attempt to create as many special candies as you possibly can. While making special candies is an important tip in Candy Crush Soda Level 409, avoid using them as soon they are generated. The primary aim of making special candies is to combine them so that you can maximize their effect. As stated, the ingredients will drop down from the ingredients dispensers. However, there is a little twist to it; they are dropped in columns that do not have exit points. It, therefore, means that for you to increase your chances of passing through level 409, you will have to move the candies. The best approach to deal with this is to make an attempt to move both on one side and the work to taking down the cupcakes. These Candy Crush Soda cheats and tips will help you beat Candy Crush Soda level 28. The objective of level 28 is to Find 1 bear in 30 moves. The bottom half of this board is filled with multi-layered cupcakes and licorice X’s. Look to clear out these cupcakes and licorice X’s as soon as possible. The bear will be hiding underneath these blockers. Continue to make combinations along the sides of the blockers to clear them out of your way. These Candy Crush level 12 cheats and tips to show you how to beat level 12 of Candy Crush. The goal of level 12 is to bring down 4 ingredients and score 40,000 points in 35 moves. Level 12 Cheat #1: Avoid ingredients going to the side. You need to bring down 1 Hazelnut and 3 Cherries. Having ingredients fall to the side will make it harder to clear. There are less squares and spaces to make moves and drop the ingredient. If you find that an ingredient has fallen to the side, use a lollipop booster to remove the candy. These Candy Crush Dreamworld level 12 cheats and tips to show you how to beat level 12 of Candy Crush. The goal of level 12 is to bring down 6 ingredients at get at least 60,000 points in 30 moves..
Level 12 Cheat #1: Destroy the meringue quickly. You’ll need to ensure all the ingredients can drop down to the bottom row, so all the meringue needs to go. Any remaining blocks will just hamper your ability to complete the level. Match horizontal rows of candy to destroy as much meringue as possible with each move. Level 12 Cheat #2: Make lots of special candies. special candies can help you get to 60,000 points easily and destroy huge swaths of meringue quickly. wrapped candy bombs are especially valuable when getting rid of the meringue blocks. Drop horizontal striped candy to the bottom row to easily make room for ingredients.